Michael Keane feels Burnley can continue to cause teams problems at Turf Moor. The Clarets claimed their second Premier League win of the season on Monday night, beating Watford 2-0, and are the only side to beat Liverpool so far this season. Arsenal are the visitors on Super Sunday (kick-off 4-30 p.m.), with Keane aiming to pick up more points on home soil. The centre back, who scored his first Premier League goal against Watford, said: “Arsenal have been playing really well themselves and had a great result at the weekend, iand t will be tough just like Liverpool was. “But on our day, if we’re organised and we play well, then we can frustrate teams and cause them a lot of problems. “It (Turf Moor) became a fortress for us last year and we’ve kicked on, apart from Swansea on the opening day, which was disappointing. The former Manchester United man – reportedly a £25m January target for Chelsea – believes the performance against Watford topped that that saw off Liverpool: “I think we were much better on the ball, we went in five with midfield to get on the ball better and be more creative, and I thought we played really well, had more of the ball and created more chances. “It’s our most dominant performance of the season, both goals came at good times, we had a great first half and if we’d gone in at 0-0 we’d have been a bit disappointed, to be 1-0 up was a good boost for us. 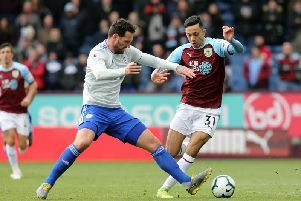 Burnley’s five Premier League goals have been scored by five different players now, and Keane is pleased the side aren’t just relying on the forwards: “I think it’s big, you can’t rely on one or two players, everyone has to chip in. We’ve got goals coming from everywhere now, whether it’s strikers, midfielders or defenders, that can only help us going forward. “But to score in front of your own fans is a special feeling. It’s a big moment, I’m sure my family will be proud.